WASHINGTON — President Donald Trump is wrong when he suggests global warming can’t be happening if it’s really cold outside. He points to a “brutal and extended cold blast” in the Eastern U.S. during Thanksgiving week and wonders aloud to his Twitter followers, “Whatever happened to Global Warming?” In fact, he is confusing short-term weather patterns with longer-term climate change. A scientific report put out Friday by his own administration rejects as folly any notion that a particular plunge in temperatures can cast doubt on whether Earth is warming. Explaining his decision not to punish Saudi Arabia for the killing of a U.S.-based journalist, Trump also exaggerates the value of Saudi investments in the U.S. and expresses thanks to the kingdom — then himself — for spurring a recent decline in oil prices. Those claims are off the mark. A look at his recent rhetoric, also covering the courts, midterm elections and more. TRUMP: “So great that oil prices are falling (thank you President T). Add that, which is like a big Tax Cut, to our other good Economic news. Inflation down (are you listening Fed)!” — tweet Sunday. TRUMP: “Oil prices getting lower. Great! Like a big Tax Cut for America and the World. Enjoy! $54, was just $82. Thank you to Saudi Arabia, but let’s go lower!” — tweet Wednesday. THE FACTS: Heaping praise on Saudi Arabia, then himself, for lower oil prices is a gross oversimplification. Oil prices, which peaked Oct. 3, have been falling on the realization that U.S. sanctions against Iran would not create a shortage and on fear that slower economic growth internationally will depress energy demand. Although the U.S. is now the world’s biggest oil producer, Saudi Arabia remains the biggest exporter. As a so-called swing producer with the ability to adjust production up or down relatively quickly, it can indeed influence the price of crude. But the market is far more complex than Trump suggests. Canada is actually the leading source of U.S. oil imports, for example, with Saudi Arabia second. TRUMP: “This is the coldest weather in the history of the Thanksgiving Day Parade in NYC, and one of the coldest Thanksgivings on record!” — tweet Thursday. TRUMP: “Brutal and Extended Cold Blast could shatter ALL RECORDS – Whatever happened to Global Warming?” — tweet Wednesday. THE FACTS: Trump is conflating weather and climate. Weather is like mood, which changes daily. Climate is like personality, which is long term. The climate is warming, which still allows for record cold spells. On Friday, the White House produced the National Climate Assessment by scientists from 13 Trump administration agencies and outside scientists. It amounted to a slap in the face for those who question whether climate is changing. “Climate change is transforming where and how we live and presents growing challenges to human health and quality of life, the economy, and the natural systems that support us,” the report says. It details how global warming from the burning of coal, oil and gas is hurting each region of U.S. and different sectors of the economy. The report said the last few years have smashed U.S. records for damaging weather, already costing nearly $400 billion since 2015, and projects increased deaths and disease. In other words, there are cold days in a warming climate. TRUMP: “Justice Roberts can say what he wants, but the 9th Circuit is a complete & total disaster. It is out of control, has a horrible reputation, is overturned more than any Circuit in the Country, 79%, & is used to get an almost guaranteed result.” — tweet Thursday. TRUMP: “It would be great if the 9th Circuit was indeed an “independent judiciary,” but if it is why … are so are so many opposing view (on Border and Safety) cases filed there, and why are a vast number of those cases overturned. Please study the numbers, they are shocking.” — tweets Wednesday. THE FACTS: He’s incorrect in suggesting that rulings by the 9th U.S. Circuit Court of Appeals in San Francisco are reversed by the Supreme Court more frequently than those of any other federal appeals court. His description of the “shocking” number of overturned cases in the 9th Circuit belies the nature of the appeals system. When the Supreme Court hears a case, it is more likely to overturn it than not. It does so about two-thirds of the time. In the last term, the Supreme Court overturned 100 percent of the decisions of the 1st Circuit in Boston, the 3rd Circuit in Philadelphia and the 6th Circuit in Cincinnati. For the 9th Circuit, 86 percent were overturned. Over the past five years, the Supreme Court overturned a greater percentage of rulings from the 3rd Circuit (92.3 percent), the 6th Circuit (85.1 percent) and the Atlanta-based 11th Circuit (81.8 percent) than from the 9th (77.4 percent), according to The Associated Press’ analysis of statistics from the legal website Scotusblog. The 9th is by far the largest of the 13 federal courts of appeals, covering Alaska, Arizona, California, Hawaii, Idaho, Montana, Nevada, Oregon and Washington. That means that in raw numbers, more cases are heard and reversed from the 9th year in and year out. But that does not make it the most frequently overturned. On Monday, U.S. District Judge Jon Tigar, who’d been nominated by Democratic President Barack Obama, temporarily barred the Trump administration from refusing asylum to immigrants who cross the southern border illegally. That set off Trump’s ire. Any appeal is likely to go to the 9th Circuit. TRUMP, on his impact on the midterm elections: “Look at Florida. I went down to Florida. Rick Scott won and he won by a lot. I don’t know what happened to all those votes that disappeared at the very end. And if I didn’t put a spotlight on that election before it got down to the 12,500 votes, he would’ve lost that election, OK? … They would have taken that election away from him.” — interview with “Fox News Sunday,” broadcast on Nov. 18. THE FACTS: Trump is exaggerating the vote margin of Scott’s victory in Florida’s Senate race as being “a lot.” He’s also suggesting without evidence that his own efforts prevented Democrats from engaging in voter fraud. Scott, Florida’s Republican governor, edged out Democratic Sen. Bill Nelson in the closest Senate race in the nation in the midterm elections — by a margin of 10,033 votes, or 0.12 percentage points. It also was the closest Senate race in Florida since at least 1978, according to the Florida’s Division of Elections website. It required two recounts — by machine and by hand — as mandated by state law due to the razor-thin margins. Despite Trump’s repeated claims after the Nov. 6 election of Florida races being potentially “stolen,” the state agencies charged with investigating potential fraud have said no credible allegations exist. It’s not uncommon for vote tallies to change in the days after Election Day as local officials process remaining mailed and provisional ballots. In Florida, Scott saw some of his lead dwindle after the Democratic strongholds of Palm Beach and Broward counties continued to count votes. TRUMP: “After my heavily negotiated trip to Saudi Arabia last year, the Kingdom agreed to spend and invest $450 billion in the United States. This is a record amount of money. It will create hundreds of thousands of jobs, tremendous economic development, and much additional wealth for the United States. Of the $450 billion, $110 billion will be spent on the purchase of military equipment from Boeing, Lockheed Martin, Raytheon and many other great U.S. defense contractors. If we foolishly cancel these contracts, Russia and China would be the enormous beneficiaries — and very happy to acquire all of this newfound business.” — statement Tuesday. THE FACTS: He’s greatly overstating the value of expected Saudi investments in the U.S. The arms package, partly negotiated under the Obama administration, mixes old deals, some new business and prospective purchases that have not been worked out. The Pentagon said last month that Saudi Arabia had signed “letters of offer and acceptance” for only $14.5 billion in military purchases and confirmed Tuesday that nothing further has reached that stage. Those letters, issued after the U.S. government approves a proposed arms sale, specify its terms. Much of that $14.5 billion involves a missile defense system, a contract that appears to have advanced more than other significant investments but not been completed. Moreover, the State Department estimated last year that if the full $110 billion in prospective arms business is fulfilled, it could end up “potentially supporting tens of thousands of new jobs in the United States.” That’s a far cry from the 500,000 to 600,000 jobs that Trump has said the arms deal is worth. Details of the package have been sketchy, with no public breakdown of exactly what was being offered for sale and for how much. The government’s Congressional Research Service has described the package as a combination of sales that were proposed by President Barack Obama and discussed with Congress and new sales still being developed. Meanwhile, there has been no verification from either country that “the Kingdom agreed to spend and invest $450 billion in the United States,” as Trump put it in his statement. White House spokeswoman Lindsay Walters did not respond to a request to explain the figure. TRUMP: “Saudi Arabia would gladly withdraw from Yemen if the Iranians would agree to leave. They would immediately provide desperately needed humanitarian assistance.” — statement Tuesday. THE FACTS: This seemingly benign view of Saudi intentions in Yemen does not square with reality on the ground. A Saudi-led blockade is at least partly responsible for widespread starvation in a country where three quarters of the population needs life-saving assistance. It’s the world’s worst humanitarian crisis. The U.S. has scaled back support for the Saudi-led coalition fighting Iranian-backed rebels and is pressing for a cease-fire. The international aid group Save the Children estimated Wednesday that 85,000 Yemeni children younger than 5 have died of hunger and disease since civil war broke out in 2015. The United Nations says more than 1.3 million Yemeni children have suffered from severe acute malnutrition since the coalition went to war against Houthi rebels. TRUMP: “Of course we should have captured Osama Bin Laden long before we did. I pointed him out in my book just BEFORE the attack on the World Trade Center. President Clinton famously missed his shot. We paid Pakistan Billions of Dollars & they never told us he was living there. Fools!” — tweet Nov. 19. Trump’s book did not call for further U.S. action against bin Laden or al-Qaida to follow up on attacks Clinton ordered in 1998 in Afghanistan and Sudan after al-Qaida bombed the U.S. embassies in Kenya and Tanzania. The U.S. attacks were meant to disrupt bin Laden’s network and destroy some of al-Qaida’s infrastructure, such as a factory in Sudan associated with the production of a nerve gas ingredient. They “missed” in the sense that bin Laden was not killed in them, and al-Qaida was able to pull off 9/11 three years later. In passages on terrorism, Trump’s book correctly predicted that the U.S. was at risk of a terrorist attack that would make the 1993 World Trade Center bombing pale by comparison. 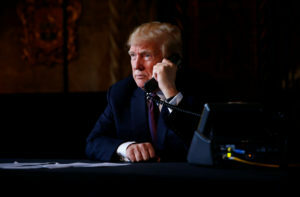 That was a widespread concern at the time, as Trump suggested in stating “no sensible analyst rejects this possibility.” Trump did not explicitly tie that threat to al-Qaida and thought an attack might come through the use of a miniaturized weapon of mass destruction, like a nuclear device in a suitcase or anthrax. Associated Press writers Seth Borenstein, Robert Burns and Josh Boak in Washington, Jill Colvin in Palm Beach, Fla., and David Koenig in Dallas contributed to this report.